If you follow this blog, could get the impression that I eat nothing but meat for every meal of the day. You might be surprised to know that if I don't bring leftovers to work, my favorite lunch is a VEGGIE SUB from Lenny's Sub Shop. Yeah, this carnivore has a thing for VEGGIE subs. 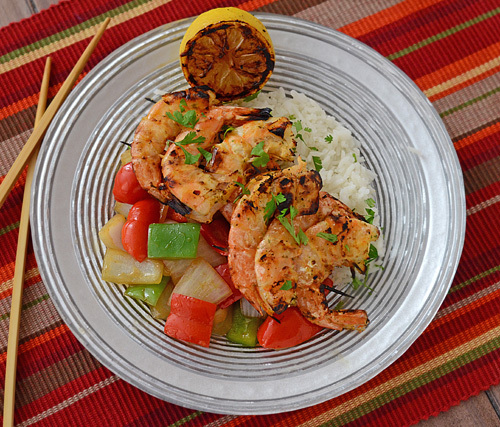 What does a sub shop have to do with a Grilled Thai Shrimp recipe? Easy. Every time I get the same thing (on white, provolone, swiss, lettuce, tomato, onion, green bell pepper, pickles, black olives, oregano, mayo and the hot red pepper relish). That hot pepper relish is what makes it so good. I buy jars of it from them to use at home in recipes. So Monday as I was paying for my veggie sub, I saw this recipe that they had. I was going to make it but you know me. I can't follow a recipe to save my life, I have to create something of my own. Put the marinade ingredients into a blender and thoroughly mix together. 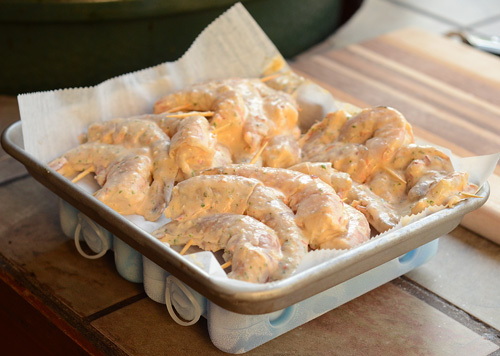 Pour over the shrimp and marinate for 30 - 45 minutes. Note: For mild, use 1 Tbsp of the relish, 2 for medium and 3 for hot. Preheat a charcoal grill to 500f and make sure your grill grates are clean. 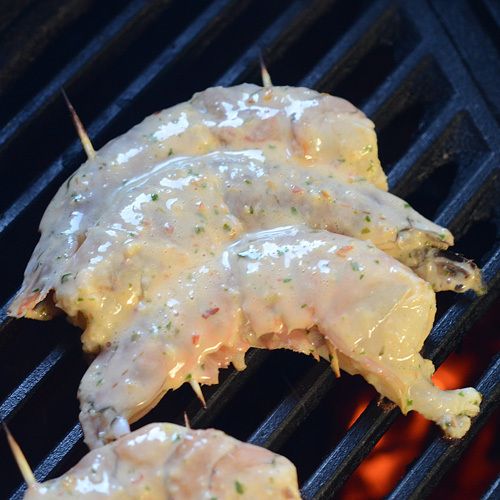 Assemble skewers: Place three of the shrimp on a cutting board so they are stacked, alternating head to tail as pictured. Piece with two of the skewers. Grill: Lightly oil the grill grates. Grill the skewers 3 minutes and then flip them. Add the lemon halves, cut side down. 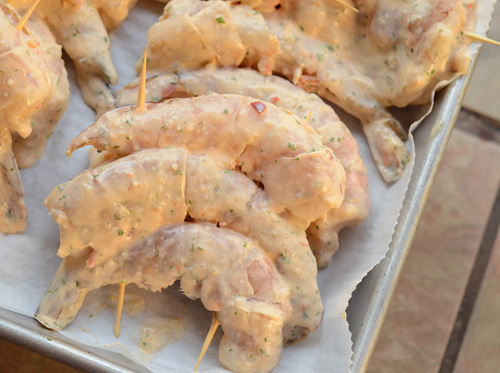 Finish cooking the skewers until the shrimp are bright pink and cooked through, another 2-3 minutes. Finish: Remove the skewers to a plate. 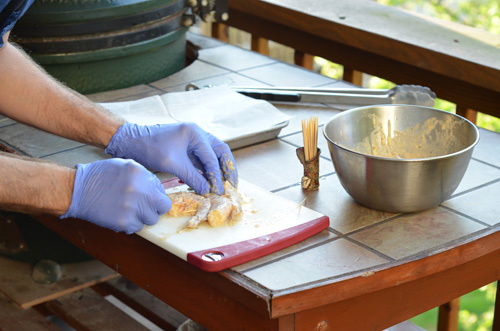 Using long tongs, squeeze the lemon halves over the shrimp. Serve immediately. 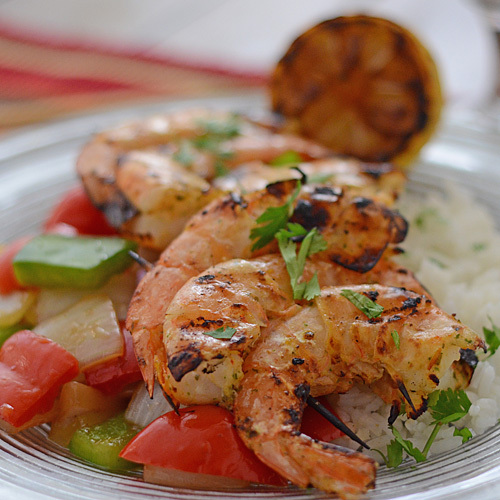 Serving suggestions - serve with Jasmine cilantro rice and stir fried veggies. The hot pepper relish is vinegary, spicy, and makes a veggie sub kick it. 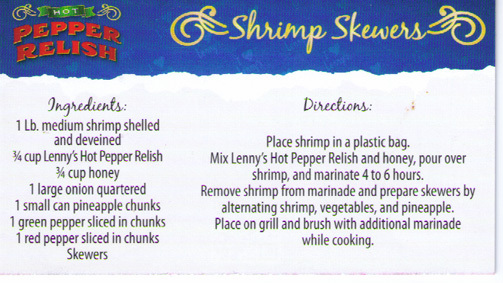 I wanted a stir fry side dish but stir fry and shrimp need to be served quickly after cooking. 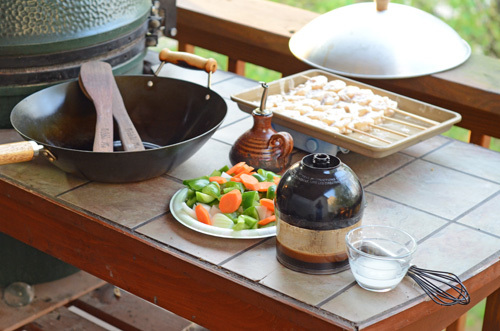 For us, it worked best to cook the veggie stir fry first then grill the shrimp, but you have to have it all ready to go before you start. Notice how the shrimp are alternated head to tail . This promotes even cooking. 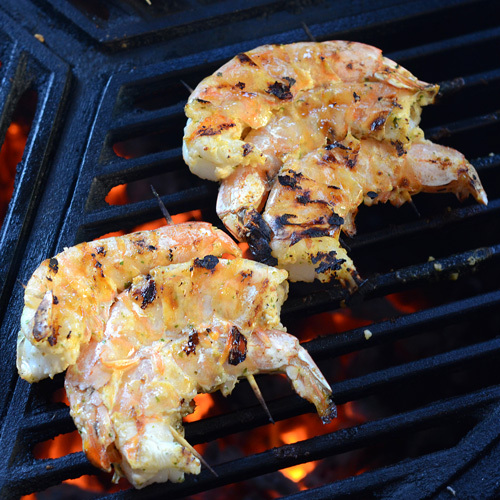 Seafood deteriorates quickly so keep it on ice while getting the grill fired up. See the flavor in that marinade? Use tongs, the lemon and juice are still HOT. I tried a side by side experiment with this. I tried grilling with the shells on and shells off. The one with the shells were a little more tender but had less of the marinade flavor. The ones without the shells had the full impact of the flavorful marinade. 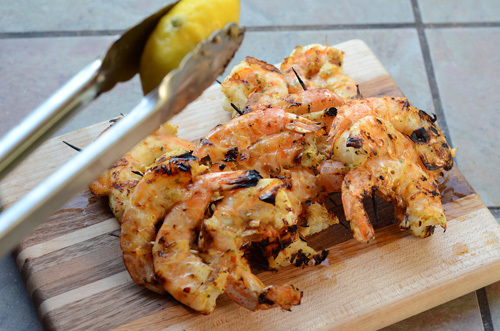 How do you like to grill your shrimp? Shells on or off? 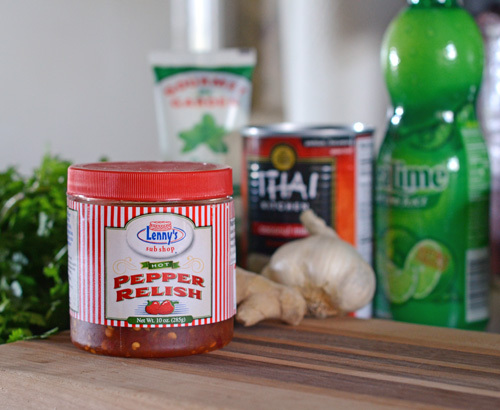 [Standard disclaimer] I have no affiliation with Lenny's and paid full price for the relish.